click here to see the entire schedule for 2019! What’s a Jason Lanier workshop like? It’s the ANTI-Workshop. It’s real, it’s hands-on, and it delivers actual results for you. IT MEANS IT’S A HANDS-ON LEARNING ENVIRONMENT WHERE YOU LEARN TO SHOOT, LIGHT, POSE, COMMUNICATE AND DIRECT SO YOU CAN REPRODUCE THE RESULTS FOR YOURSELF AFTER YOU LEAVE. WE OFFER A VARIETY OF WORKSHOPS INCLUDING TRAVEL PHOTO ADVENTURES, PHOTO WALKS, MASTERING PORTRAITURE, REAL WEDDING WORKSHOPS, BECOMING A KILLER WEDDING PHOTOGRAPHER BOOTCAMPS, AND COSPLAY. click Here to see the 2019 schedule!! Have you ever wanted to go to a far away place for a once in a lifetime adventure? Want to receive world class instruction and education landscape and wildlife photography in exotic places like a safari in South Africa? Want to roam the music filled streets to dos street photography in locations like Cuba? Jason has had the opportunity to travel all over the world and is now opening up his travel excursions to all of you! 1 on 1 critiques, group image reviews, on site instruction are just some of the amazing things offered on these trips. A PHOTO WALK IS A MINI WORKSHOP WHERE ACTUAL LEARNING OCCURS TYPICALLY LASTING BETWEEN 2-3 HOURS. MANY OTHER PHOTO WALKS OUT THERE ARE SIMPLY AS THE NAME DENOTES….YOU FOLLOW A PHOTOGRAPHER OR TWO AROUND AND SHOOT THE SAME THINGS THEY ARE SHOOTING, JOCKEYING FOR POSITION. JASON PRIDES HIMSELF ON MAKING HIS PHOTO WALKS A TRULY DIFFERENT AND UNIQUE EXPERIENCE. The Mastering Portraiture Workshop is for those looking to take their portrait game to the next level. 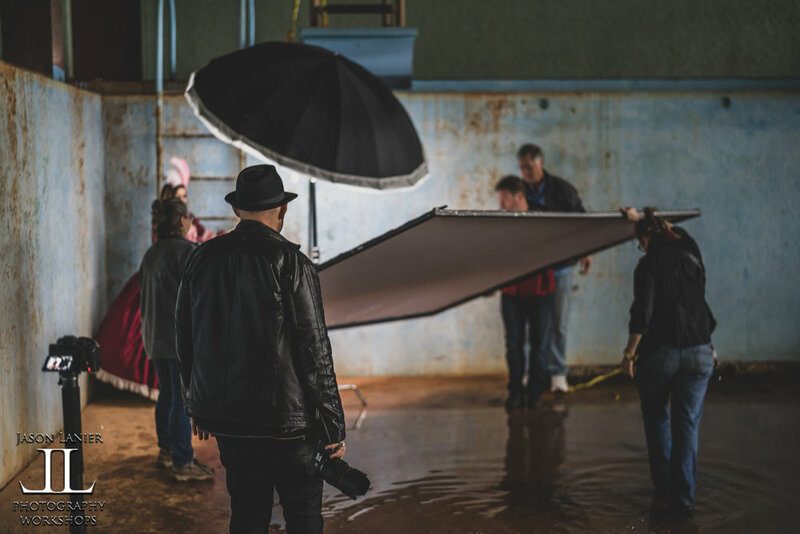 This workshop is 3 days and offers photographers the opportunity to learn and experience real world portrait shooting environments in both indoor studio and outdoor on location sets. This is two days of shooting with one additional day of editing where you can learn how to take what you do shooting with Jason and edit it to create your own unique look. MASTERING PORTRAITURE WORKSHOP IN HELEN, GEORGIA. In the world of photography there aren’t many things that pay as consistently and as reliably as wedding photography. Join award winning wedding photographer Jason Lanier for an intensive 4 day bootcamp where you will learn how to shoot wedding photography using models in wedding attire, get 1 on 1 critiques, learn how to light and shoot SPECIFICALLY for weddings. You’ll then get to learn how to edit for a smooth and efficient workflow on Day 3, followed up with a business course for pushing your wedding business to the next level! If you are an aspiring or established wedding photographer this 5 DAY Experience is the ULTIMATE way to take your photography to the next level. And YES, this entire experience is wrapped around an actual REAL Wedding that you will get to shoot with Jason. Day 1 starts off with 1 on 1 critiques reviewing your current work and where you stand. It then moves into shooting models dressed in wedding attire. Day 2 is meeting the actual wedding couple the day before the wedding to do an engagement shoot. Day 3 is the ACTUAL WEDDING! Day 4 we take the images from the wedding day and edit them where you learn how to take your editing and workflow to the professional level. Day 5 is wedding business and how to market all you’ve created over the previous 4 days. If you are intermediate, experienced, or pro photographer and you want the course that doesn’t include the basics but skips to the harder stuff…THIS IS IT. Jason’s followers have been asking him for courses that move the lighting game to the next level. We’re talking big light set ups using 3, 4, 5 or more lights with big costumes, prep work and more!